Can I get a copy of my bill for free? Firstly, if you haven’t registered yet, you will need to set up your My Vodafone account. Registration is easy. Just follow the steps on screen. Download the app free from iTunes or Google Play Store. Click the menu button on top right of the app home page and select ‘Bills & payments’. Find the bill you want to see and click the download icon. Log in to My Vodafone using your username and password. Click on the menu icon on the right hand side of the screen and select ‘Bills & payments’. 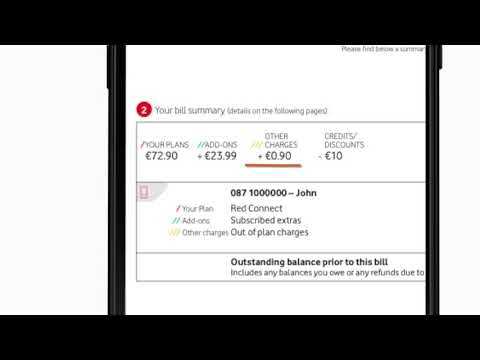 If you need help understanding your bill, check out our simple-to-follow visual guides for My Vodafone app or online. If you need help understanding your first bill, check out our simple-to-follow video guide. What can I expect from a Vodafone call-back? Press 1: If you are available to take the call, you will be connected to a care agent. Press 2: If you need more time before speaking with us. Press 3: To reschedule your call-back. Press 9: To cancel your call-back request. What happens if I miss my call-back? Don’t worry, we will try to call you up to 3 times, at 5 minute intervals. How do I remove a network lock from my phone? Once you've submitted the request, the table below will advise how quickly you can expect to hear back. How do I get a new or replacement SIM card? The quickest way to get a new SIM card is to call to any Vodafone store where you can get one free of charge. You will be required to produce one form of photo I.D before the SIM change can take place. You can also order one on My Vodafone. Firstly, if you haven’t registered yet, you will need to set up your My Vodafone account. Registration is easy. Just follow the steps on screen or, check out our handy video guide which will show you the few simple steps it takes to register. Note: If you don't have your Self Service PIN, you can reset in online. To do this, simply log in to My Vodafone, go to My settings in the menu (or Personal details on the My Vodafone app), then select Personal settings. If you haven't already registered for My Vodafone, check out our handy video guide which will show you the few simple steps it takes to register. When will I be eligible to upgrade my phone? You can now check this by simply logging in to My Vodafone! Next, just log in with your username and password. If you are eligible for an upgrade, you will get a message at the top of the screen and you will be able to upgrade online. I'm unable to browse certain sites on my phone, what can I do? To protect our younger customers from accessing sites which may not be appropriate, we use a content filtering system to restrict these sites from being displayed (This may be shown in the address bar as: '10.163.18.69:80/XMPBLOCKED/HOLDING'). To check if you have an age restriction in place please contact us on 1907 or by using Live Chat. For instructions on how to switch on your Caller ID, visit our Device Guides. Choose your device, go to 'Calls and contacts' and you'll find instruction called 'Turn your own caller identification on or off'. If it still doesn’t work, then contact one of our Live Chat agents for more help. How do I reset my Voicemail greeting? To reset your Voicemail greeting, you will need to get in contact with one of our agents on our Community.